Lifetime of installation is according to country-specific licensing process, usually 20-30 years. Potential for positive and negative interactions, depending on the location. Likely exclusion of fishing and shipping around wave and tidal arrays. What are the present spatial needs of the Tidal and Wave Energy sector? Wave and tidal projects are placement-driven and depend on the resource potential in a given location. Unlike wave energy, tidal resources are not widely distributed and are found in specific areas, limiting the geographical expansion of the tidal energy sector. Increased demand for space: The ocean energy sector as a whole foresees larger-scale projects of up to 50MW by 2020 in preparation for full commercialisation from 2025 with the ambition to provide 10% of Europe’s energy demand in the next 35 years. Commercialisation of wave energy conversion technology: Could result in major spatial implications in areas where wave resource is present, both in terms of individual devices and commercial arrays. MSP should be informed by accurate resource mapping to identify areas of interest for ocean energy development. Wave and tidal energy needs to be considered separately given the different stages of development and sector requirements. Co-operation between authorities responsible for MSP and offshore energy developments is essential to ensure that the changing spatial demands for wave and tidal energy are considered from the outset of planning processes. MSP can support planning strategic electricity transmission. This includes promoting transnational initiatives, and setting policies for effective use of submarine cabling and onshore transmission between projects, and with other technologies such as offshore wind. MSP provides an information base, reducing uncertainty around impacts and can reduce risk in consenting. Please visit the long-version of the sector fiche which includes further detailed information, resources and references. What is the status of the technology of the sector? What are the spatial implications of these? Ocean energy technologies (referring to wave and tidal energy) are in development as a potential commercially viable source of power from renewable energy. Progress differs across technologies and there is huge potential in the sector. As technology advances from prototypes to large-scale commercial arrays, there are implications for the planning of maritime space. Tidal energy technology is at a more advanced stage due to convergence of technology and involvement of large industrial players and utility companies, although still not yet commercial scale. Traditionally, tidal rangetechnologies have been the focus of development; these harness the movement of water through a bay or estuary and include more traditional barrages. Operational tidal range technologies can be found in France (the Rance Tidal Power Station), whilst a new tidal lagoon technology includes the proposed 320 MW Swansea Bay Tidal Lagoon in Wales, UK. More recently, extensive R&D is focussed on the development of tidal current technologies, which harness the power of tidal water movement through underwater turbines. Various devices and components are being tested with some progress from prototype to commercial scale devices (including the Meygen project in Scotland, and the Paimpol-Brehat project in France). Wave energy is at a much earlier stage, with most development focussed on prototype devices and components. Technologies include floats, buoys, or pitching devicesthat generate electricity using the rise and fall of ocean swells to drive hydraulic pumps. A second type uses oscillating water column (OWC) devicesto generate electricity at the shore using the rise and fall of water within a cylindrical shaft. Third, a tapered channel, or overtopping devicecan be located either on or offshore. There is also the potential for wave energy converters to power offshore activities, such as aquaculture. 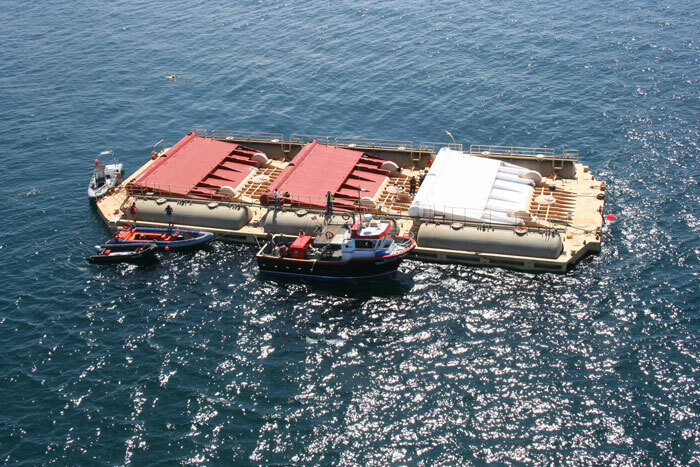 Numerous R&D projects are addressing the progress of wave energy devices to commercial scale arrays or wave farms. These include the Powerkite Horizon 2020 research project, focussing on ‘power take-off’ (transfer of energy from the device) and seabed tethering of devices among other concepts. The CEFOW (Clean Energy from Ocean Waves) proposes to connect 3 Wello ‘Penguin’ wave energy convertors at the EMEC test centre in Orkney, Scotland. The Horizon 2020 MaRINET2 project, announced in April 2018, will fund access to a network of research facilities across Europe, in order to advance 32 new technologies through a competitive process, including technologies such as the Laminaria wave energy device. 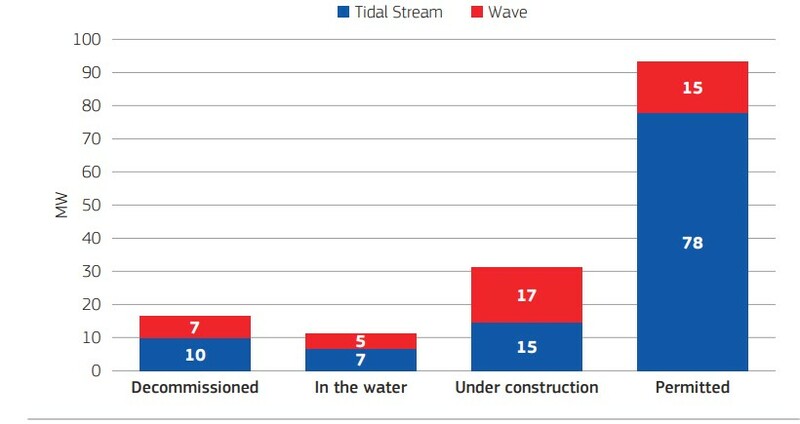 Although the progress in the uptake of tidal and wave energy has been slower than expected over the last 10 or 15 years, further commercialisation in tidal and to some extent wave energy technologies can be expected in the years to come, based on continued funding into these areas. Such ‘upscaling’ in areas of resource availability will have implications to be considered through maritime spatial planning including increased interaction with other sectors and ecological impacts. What is the current understanding of the primary ecological concerns of ocean energy devices? Installation of devices at sea result in interaction with the environment, some of which may be of ecological concern. Impacts will vary according to the technology type, size of device or array, location and other operational and site characteristics. As technologies are novel, there is limited availability of data which can provide evidence on the extent of ecological effects. There is therefore significant uncertainty in predicting what these would be for a particular proposed technology or project. This poses challenges for the industry when progressing through planning and consenting processes, as legislative requirements in relation to conservation require a high level of scientific certainty that species and habitats of importance will not be negatively affected. Project delays and cost implications of lengthy Environmental Impact Assessment (EIA), Appropriate Assessment (AA) and other aspects of licensing and consenting to reach conclusions on predicted impacts and their ‘acceptability’ are a key challenge for ocean energy developers. Substantial investment has therefore been made into understanding the ecological effects of ocean energy proposals, to develop the evidence base for undertaking EIAs and making applications. Projects such as Tethys facilitate exchange of information and data on the environment, collating reports such as “The State of Knowledge for Environmental Effects: Driving Consenting / Permitting for the Marine Renewable Energy Industry” produced in January 2018. Proposed ocean energy projects would need to be considered in the development of MSP, and the most up to date information will be set out by each project proponent, according to the technology type and operational characteristics proposed.